To create a data source using iFormBuilder, go to the Connector Gallery page in Klipfolio and select iFormBuilder. During the authentication process in Klipfolio, you are asked for your iFormbuilder Server Name and then you are asked to authenticate. 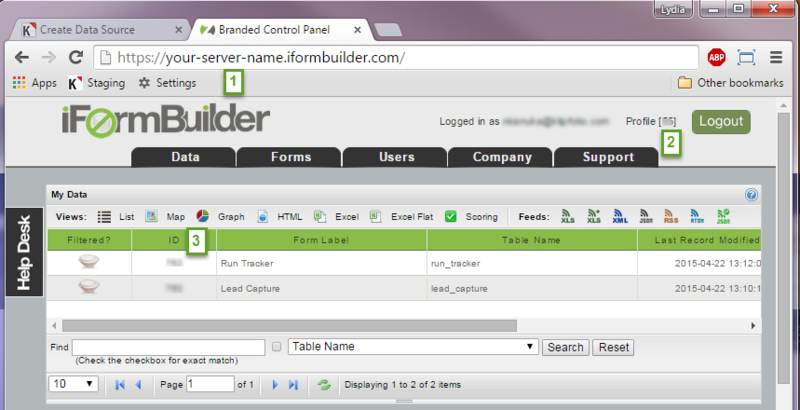 To find your Server Name, open a new tab and log into your iFormBuilder account. In iFormBuilder, copy your Server Name from the URL in the address bar (see image below). In Klipfolio, paste your Server Name in the space provided and click Next. Click Sign In to iFormBuilder. You now have an OAuth token that looks like this: George @ iFormBuilder. Click Save. Note: To learn more about OAuth tokens, see Managing OAuth Tokens. You are now ready to write a query in Klipfolio. As you are writing your query, refer to the iFormbuilder API Documentation. Open your iFormBuilder account in a new tab. Navigate to the address bar. Copy your Server Name from the URL (see the image below) and paste it into your query. Your Profile ID is in this format: Profile [your-profile-id]. Copy the Profile number and paste it into the query. Ensure that you are on the Data tab where there is a list of forms. The column ID, contains the Page ID of each form. Choose an ID number and paste it into the query. By default, iFormBuilder returns up to 100 records. To increase this limit, Contact iFormBuilder's Help Center.